We traveled to Tunis, Tunisia this winter break through the New Initiative for Middle Eastern Peace’s annual research trip program. Each member of our trip is focusing on a different research topic. Mia is looking at barriers for youth job creation, Jenny is focusing on the energy sector, and Nesi is exploring the comparison between Turkey and Tunisia’s political Islamic movements and secularization policies. We each came on this trip hoping to meet experts in our respective fields and interview them, eventually producing a research paper presenting our findings. We arrived in Tunis on Tuesday, January 3rd and settled into our hostel located in the old city of Tunis. La Medina is a beautiful little area made up of narrow cobblestone streets that completely shuts down at night -- finding a place nearby for dinner is hard! On our first night, we had dinner at a nice place called Dar El Jeld, rated number 1 on TripAdvisor, which had Tunisian cuisine and music. 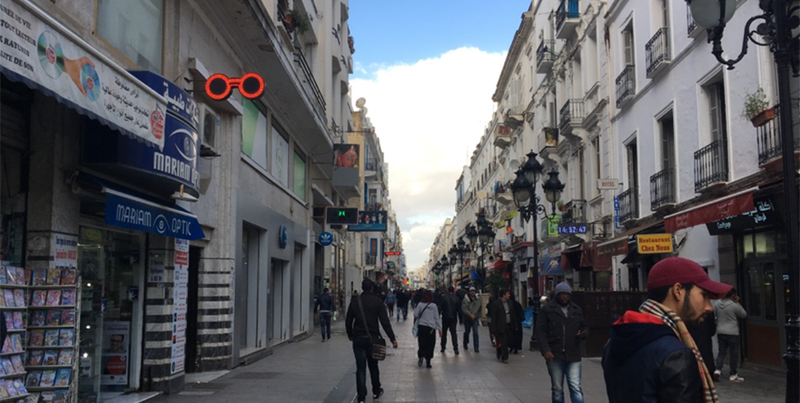 On our first full day in Tunis, we walked through La Medina and explored the modern center of town, all built around the main road Habib Bourguiba. We found a small coffeeshop with wifi, and each worked on our individual research projects. We ended the first day by returning to our hotel (where the wifi is not so good) and preparing for our meeting the next day. The next day, Thursday, we had a meeting scheduled with people at the Maghreb Economic Forum (MEF). When we arrived, they graciously offered to host us in their office for the two weeks of our stay. They set us up with desks and internet access, and began to connect us with their own contacts in Tunisia. Luckily for us, MEF’s research focused on employment, the future development of the energy sector, and radicalisation, among other topics -- a perfect match to our research! They were able to provide us all with informative documents and helpful contacts, and were incredibly welcoming. We ended the week by continuing to work out of the MEF office and beginning to schedule meetings for the coming week. Over the weekend, we took some time to be tourists! We traveled to Sidi Bou Said, Carthage, and La Marsa, three beautiful coastal towns on the outskirts of Tunis. In Sidi Bou Said, we enjoyed gorgeous views of the Mediterranean and saw the distinctive white walls and blue doors that characterized the town. While in Carthage, we had the opportunity to go to ruins, including an old chapel, roman theater, and amphitheater! It was amazing to see how well some of the ancient architecture had been preserved. After our trip to Carthage, we took naps and got ready for another week of work at MEF.